We identify amazing charities that fight poverty at the local level. Often these groups, despite their great results, are underfunded and their communities lack awareness about their efforts. We throw concerts to celebrate their great work, raise money, and bring communities together to rally around their mission. What need do you fill? There are many really wonderful charities out there that are underfunded and lack awareness about their mission. We exist to support them. Aren’t there already a billion benefit concerts? By having a multi-city approach and a mission that is solely dedicated to putting on great shows, we can scale our concerts and generate momentum. We love individual benefit concerts, but they’re often organized by a non-profit that can’t spend a ton of time on the logistics or are thrown by an outside group supporting a nonprofit on a one-time basis. We come back every year and add expertise, so the profile of our concerts is designed to grow over time as we expand. Our Board and the relationships we’ve formed give us a great network with lots of advantages others may not have. Also, and this is important: we can take some risks that other charities can’t. Why? Because our primary program is organizing concerts, not housing the homeless or feeding people. That means that we can capitalize on market-oriented risk-reward opportunities to generate more money for our beneficiaries–without putting programmatic funds at risk. It also allows the charities we raise money for to focus on what they do best: helping people. 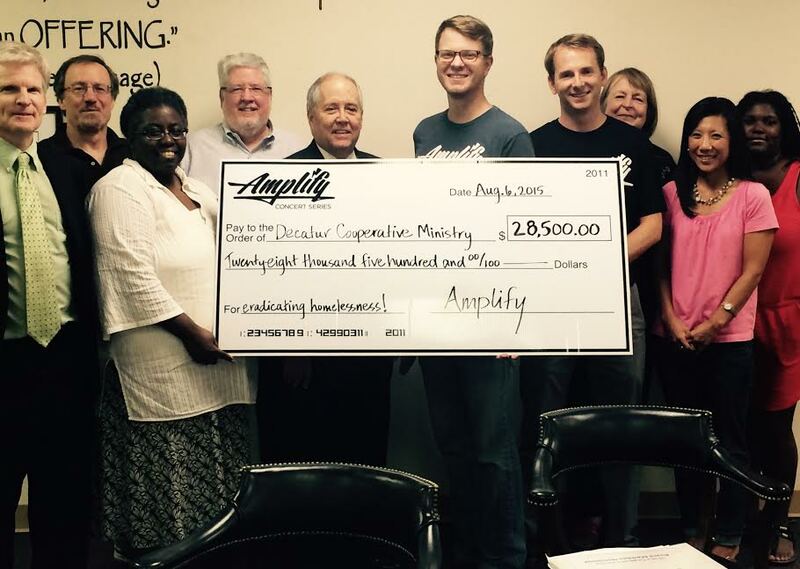 Is Amplify My Community an IRS Approved 501(c)(3)? Yes. Who do you raise money for? 4. Not discriminate in any manner. Do you provide any direct services to the impoverished? Nope. We think there’s a ton of great people out there already fighting the good fight. We exist because those charities are underfunded and often the public isn’t aware of their work. Our concerts raise money and awareness for them so they can do what they do best: help people who need it. We don’t know how to run a shelter or teach kids, but we find charities that do and that do it very well. Basically, we think the employees and volunteers of locally-acting poverty-fighting nonprofits are like firefighters: they literally pull people out of horrible situations and save lives. We celebrate and support their work, and allow them to do more. If I donate to Amplify, where does the money go? It goes towards putting on our concerts. But because we’re creating a product that enters the marketplace – our concerts – we can generate more money than is donated directly to us. We “amplify” donations to us through our shows. Here’s an example: Say this calendar year people who like what we do donate $25,000 to us. We take that money and use it to pay our expenses, which in turn allows us to go out and put on these shows. We then try to give away twice what was given to us. Using our example, we’d try to give away $50,000 from the $25,000 our supporters donated to us. If I go to a concert, does Amplify take any cut of the ticket sales? NO. We strongly believe that the money generated locally from concert-goers and local sponsorships should stay in the community. We take nothing from our shows. Ticket sales, local sponsorships, and merch sales are all donated to the local beneficiary. Again, we take nothing. To exist, we raise funds independently through donations, grants, and special events. We get our funds mostly from individual donors who believe in using music to change the world. We also recruit organizational sponsors who get presence at all of our shows. We also have support from several great foundations and are seeking additional funds to expand. What is your overhead percentage? Using traditional overhead analysis, the answer is 88% of the money we spend goes towards our program, with 12% on overhead. Our Executive Director works from home, uses a donated printer, and does everything possible to keep costs down. The majority of the money we spend is given to our beneficiaries, and Spencer (our Executive Director) is a salaried employee – he’s got to eat sometime. First, as we explained above, through our concerts we try give away double the money that’s given to us. But there’s no way to have over a 100% program expense ratio using traditional calculations. Second, looking at overhead costs to evaluate charities has been disavowed by all the major charity evaluation sites including Charity Navigator and Guidestar. In fact, part of the reason we fill a need is because nonprofits are very constrained by the overhead percentage model. Why? Well, they’re so worried about keeping overhead low, traditional charities cannot spend money on fundraising/awareness events – fundraising costs are included in overhead calculations – unless they have incredible assurances of a high return on an event. In other words, they can’t take much risk. That’s why you see so many of the same types of charity events: 5ks, galas, etc. Those stand-by events are proven money-makers with little upfront investment by the charity. While these events can be fantastic, they typically fail to draw in new audiences. Without new audiences or exciting and marketable events, it’s nearly impossible for small, locally-acting nonprofits to increase their support base and grow. Despite this reality, overhead concerns are the primary reason why you see the same types of charity events over, and over, and over, and over. Despite the repetitive nature of the events, most charities must rely on efficient – but not necessarily effective – events so that they don’t spend too much on overhead. It may be easier to think about it like this: A regular business could invest $10,000 to make $15,000 (for a $5,000 profit). That’d be applauded as a smart move. But because fundraising expenses are considered overhead, most nonprofits couldn’t do the same deal. In fact, their fundraising efforts are typically expected to generate FIVE TIMES their investment, or else their “overhead percentage” will be too low. Using the same example, a nonprofit can’t easily spend $10,000 to obtain a $15,000 donation (for a $5,000 net) because the $10,000 they spent to make the $5,000 net is considered overhead, and a return of 50% while admirable is well below the $50,000 gross, $40,000 net they’re expected to make in return. Here’s another example: If on Jan 1 of a given year a nonprofit spent $50,000 to raise its entire operating budget of $100,000, its overhead rate would be 67% ($50,000 spent on fundraising, $100k spent on operating budget, so 33% spent on on overhead and 67% on program), and they’d fail the traditional overhead evaluation. This is despite having received a 100% return on its investment – something most for-profits would absolutely kill to do. If you just raise money for other charities, shouldn’t I just donate to them? We hope you’ll support local charities however you’d like! We’re certainly not here to tell you how to donate your funds. If you’d rather give directly to them, please do! But if you love music, and think what we’re doing is innovative and helps fill a need, we hope you’ll support us. In turn, we believe our concerts will generate more funds for our beneficiaries and significantly raise their profile and potential support base. But at the end of the day, we exist to support great nonprofits – please support them how you best see fit. Most often, yes, if they are performing original material. Many artists themselves live in poverty, and we don’t set out to make our margins off of musicians and their support crew. We can generate more money for our beneficiaries by paying great bands fair rates, building excitement for a concert series, and asking businesses to sponsor the shows. While it may seem counter-intuitive, we strive to be well-respected in the music industry by paying competitive rates, thus enabaling us to attract better artists. We have recruited signficant expertise and made connections within the industry, and ensure we get a fair rate. Sometimes bands do play for free and we are incredibly grateful to them. Often this is during a cover event that doesn’t limit a bands’ ability to get other paid gigs playing their own material. The bottom line is that our goal is to generate maximum funds and publicity for our beneficiaries, and we remain flexible to come up with the best model to make that happen. What happened to Poverty Is Real? We changed our name in November of 2015 to Amplify My Community. We still very deeply believe Poverty Is Real, but it’s not our name anymore.